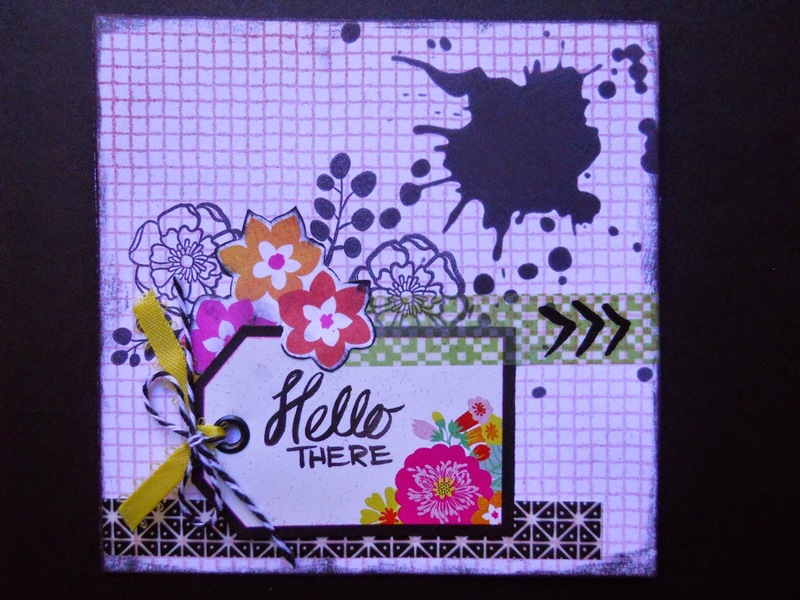 This card will be sure to bring a happy hello using Basic Grey's Highline I want it all bundle from FotoBella! 1. Cut a 6"x 6" card out of black cardstock. 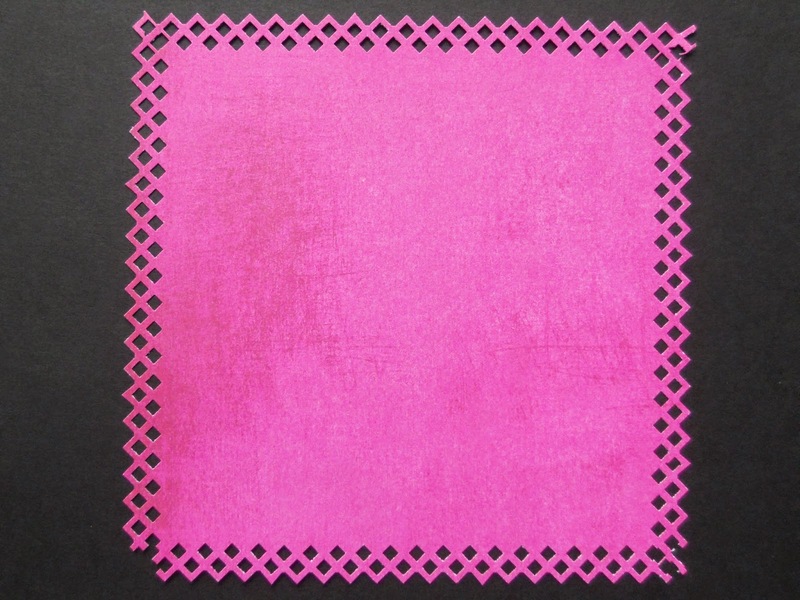 Cut the same size out of the pink "Be Yourself" paper, and punch around all of the edges using a border punch. 2. Cut 4 3/4" x 4 3/4" from the "Good Times" paper, and ink around all of the edges with Distress Ink (Black Soot). Attach the black vellum tape to the bottom, leaving about 1/2" from the right. 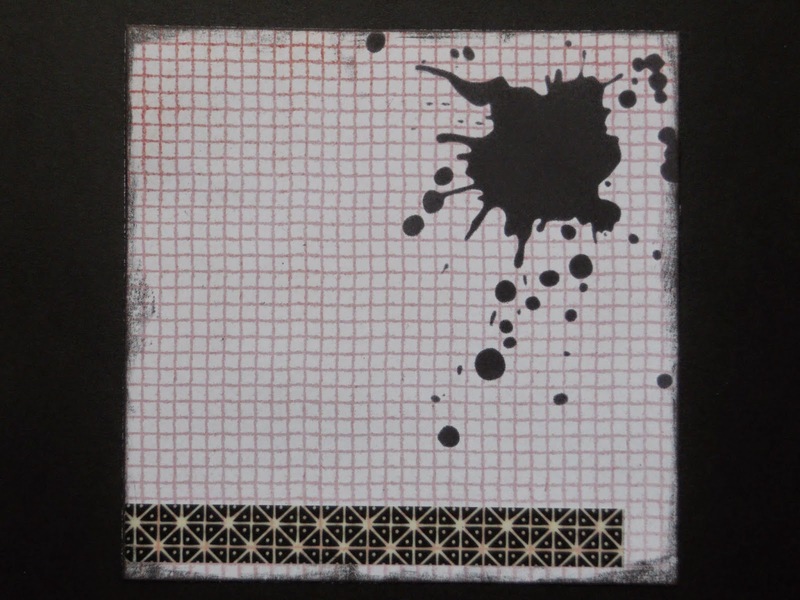 Use the Tim Holtz (Splatters) stencil to mask the splatter on the top right using the Jet Black Archival Ink. 3. 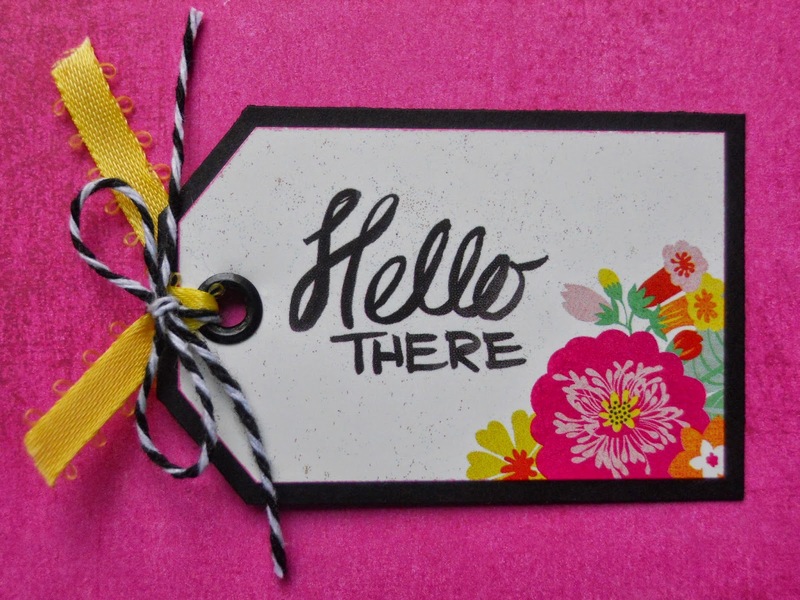 Stick the Hello There sticker tag to some black cardstock, and trim about 1/8" from the edges. Then attach a black eyelet with some ribbon and/or twine through it. 4. 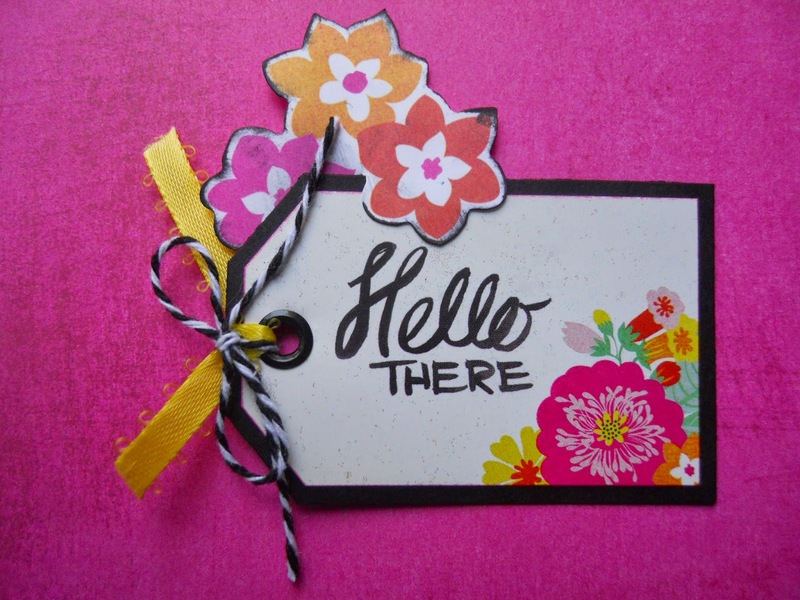 Ink the edges of the three flower die cut with Distress Ink (Black Soot) and attach to the top back of the tag, leaving the flower that overlaps free from glue. 5. 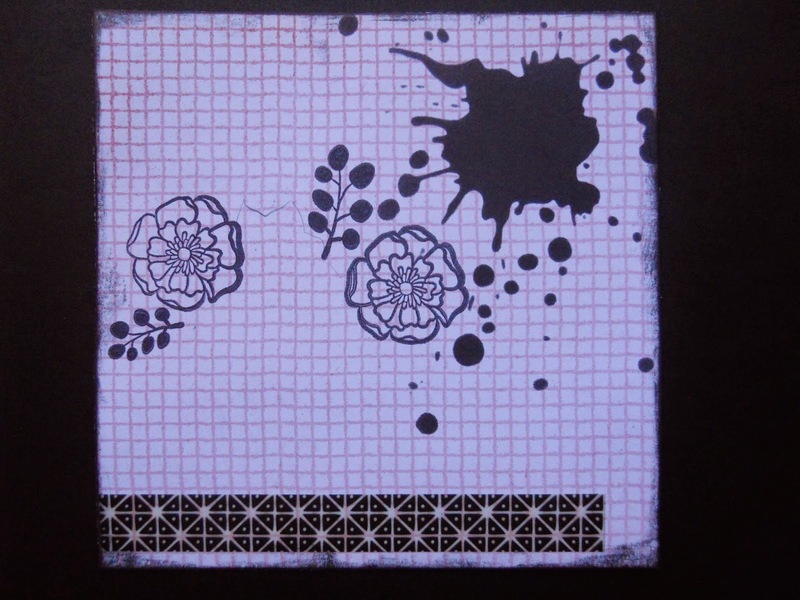 Place tag about halfway over the black vellum tape, and lightly trace around the flowers with a pencil. 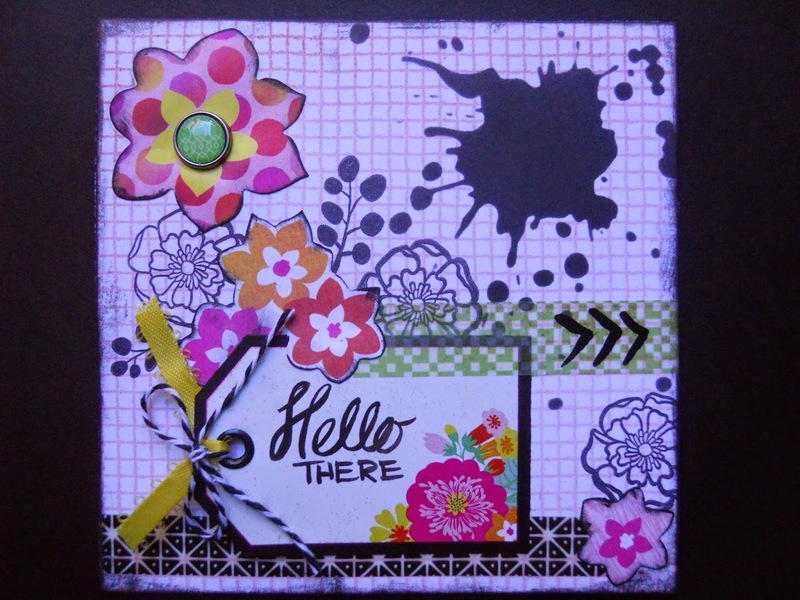 Now lift off your tag, and use some flower and/or leaf stamps around where you traced. 6. Glue down your tag, and lift the red overlapping flower to attach the green vellum tape across the top of the tag and edge of the paper. 7. 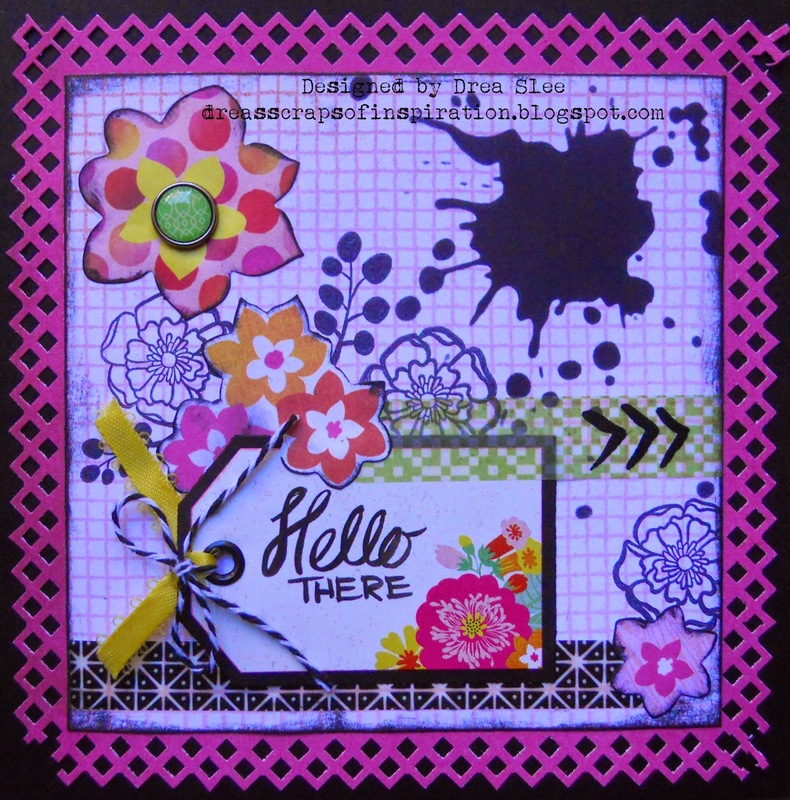 Now ink the other two floral die cuts with Distress Ink (Black Soot). Attach a brad to the larger one and place on the top left corner. Stamp another flower coming off of the side of the lower left side of the paper, and place your smaller flower over the right side of the black vellum tape. 8. To finish it up, just glue your punched paper to the black card, and your "Good Times" paper on top. I hope you'll give this card a try, and send a little cheer someone's way!